Only a 2 minute walk to the nearest beach and 10 minute walk to the nearest bars and restaurants, This offers the perfect holiday destination. 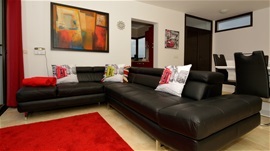 This villa has 2 lounges, a hot tub, private heated pool, an indoor pool table, darts board and wii. A large terrace runs along the upper floor of the villa where you can enjoy the sun all day whilst overlooking the superb private swimming pool. The pool is heated and accessed by steps. The lower terrace has patio doors leading from the lower lounge is perfect for private sunbathing or a game of pool. Child gates are fitted at top and bottom of stairs of sun terrace and into the pool area. Dining areas are available on both terraces plus a barbecue is provided for your use . 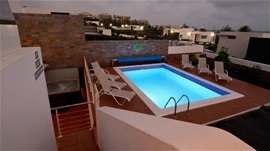 The lower sun terrace provides secluded sunbathing area for those who prefer total privacy.